Life can get crazy, calendars confused, priorities misaligned. When that is your reality it is easy to miss a significant life event. I have worked hard to be present at all the important events in the lives of my children and family members. I have sat through soccer games as my daughter stood in the middle of the field watching a hawk circle the field while the game went on around her. There were concerts where I waited patiently as hundreds of children proved it is near impossible to make music using a recorder. Saturday mornings filled with boys basketball games where the teams simply swarmed the ball and ran off excess energy. I attended Nancy’s high-school reunion with her. The list goes on. I have worked to ensure that I was present for those events significant to the members of my family. Tonight, I failed. It was not just falling short, it was a failure of epic proportions. I was not present for Nancy’s return to the basketball court! The last time she stepped on the hardcourt was 1986, the year we graduated from high-school! 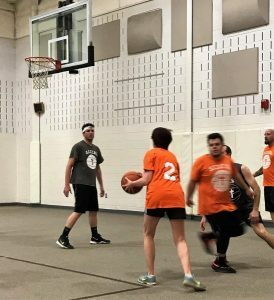 The last time she laced her shoes for a game of basketball was over thirty years ago. I know, some of you may be shocked I would share that number…but it astounds me. Thirty years without playing. Many of the boys she was playing against have yet to see their thirtieth birthday. Think about that for a moment. I had scheduled my conference with the Nehemiah Leadership Network and was out of town. In the middle of our evening presentation, my phone started to “blow up.” There were pictures on Instagram along with texts filled with images of Nancy mixing it up out on the court. I could barely hear what the presenter was saying. I had failed. This was an epic moment in the Nicewonger household, and I was not there to support Nancy. I am so proud of her strength, her fight, the toughness that resides within her. 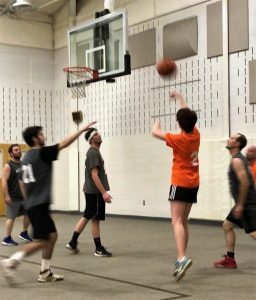 The church team asked her to play and she pulled on her shoes and went out there with the boys and gave them a run for their money. This is the resilient resolve that I know to be at the core of who Nancy is. Needless to say, I spent time reviewing my calendar so I can be sure to find a seat on the sideline and cheer her on for the rest of the games.